Cooper, S. (1975). 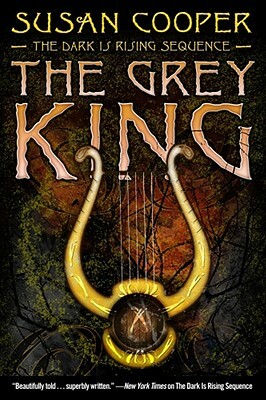 The Grey King. New York, NY: Scholastic. Genre: Fantasy, Newbery winner. Definitely fantasy, as it pulls from mythology and uses magic. And a good example of a Newbery winner. Book Summary: Will, who in an earlier book in the series realized he was an Old One, and tasked with protecting the world from the rising forces of the Dark, is convalescing in Wales, recovering from a bout of hepatitis. While there, he meets Bran, a strange local boy who helps Will fulfill part of a prophecy by stopping the Grey King from garnering his forces and waking the Sleepers in preparation for the final battle. Impressions: This is the fourth in a series, so reading it as a stand-alone probably isn’t recommended. However, I routinely re-read the second, The Dark is Rising (which, incidentally, does work as a stand-alone), so I felt comfortable dipping into this world out of order. However, for those who approach this as a stand-alone will probably be lost. There is a lack of character development, especially with Will (because you’re already supposed to be familiar with him), but also Bran, though he has a greater character arc. Cooper is a master storyteller, deftly weaving personal concerns — the neighbor who is convinced that Will’s uncle’s dogs are killing his sheep — with a greater sense of menace and tension. There is a moment when Bran’s dog is killed, and the tension between Bran and Will is palpable, especially because, as a reader, you can relate to Bran’s frustration with being a player in a higher plan and struggling with a sense of a loss of freedom because of that. Cooper’s writing is tight and elegant as well, accessible enough for younger readers (though probably not as young as eight), but smart enough to keep an adult turning pages. My only issue is that in spite of the “lesson” on speaking Welsh, I know I still don’t pronounce the names right in my head. But that’s a minor quibble. It is also one of those Newbery winners that not only deserves the award — it really is an excellently written book — but has held up as a timeless story over the past 40 years. Review: The School Library Journal wrote that, in spite of lacking in character development, the book added much to the high fantasy genre, with the most intriguing thing being the dichotomy between the plain lives of the Welsh sheepmen and the higher, mythical role the land — and Will — plays around them. Wilton, S. M. & Gerhardt, L.N. (1975, October). Book reviews. School Library Journal, 22 (2). 104-105. Library Uses: I would put this one on a display of fantasy books, series books, or older Newbery winners that are still great to read. Before I give other recommendations, I ought to recommend the most obvious and suggest reading the rest of this series: Over Sea, Under Stone; The Dark is Rising; Greenwitch; and Silver on the Tree. The Prydian Chronicles, beginning with The Book of Three, by Lloyd Alexander: While not specifically set in Wales, this series is probably the most like Susan Cooper’s books. It has the Welsh feel, the struggle between Dark and Light, and a male main character who finds out he is More than he originally thought. The Raven Cycle, beginning with The Raven Boys, by Maggie Stiefvater: This one is loosely based on Welsh mythology, though Stiefvater says that Cooper’s books were an inspiration for it. A group of four boys and one girl, the daughter of psychics, set out looking for a dead Welsh king in the hills of Virginia. Conflict, magic, and epic writing follow. The Merlin Saga, beginning with The Lost Years, by T. A. Barron: I found there is a lack of Welsh fantasy books for kids (though there is more for adults), so I tapped into the Arthurian side of Cooper’s books. Barron’s series is the definitive works for kids interested in Merlin and Arthurian legend. The books follow Merlin as he becomes a powerful wizard. One of these days I should probably reread Susan Cooper’s books. For some reason, I’ve never really liked them. I read them when they came out and haven’t read the last one. Will need to read Barron’s series at some point. Thanks again for reviewing these. This book means so much to me and has for so long. The scene with the man roaming the hills, calling out that name in the dark grey dawn, so lost and forlorn – that scene gave me chills. It’s the only part I really still remember.